Faux Hot Water Bottle is filled with rice and easily heated in the microwave. A warm comfort on cold winter nights, this faux hot water bottle is filled with rice and warmed in the microwave. I made this one for my mother, who liked the rice-filled rectangular neck rolls that I gave her for Christmas, but missed her traditional hot water bottle for warming the bed and cuddling on cold nights. She loves this version and has asked for another one. A success, methinks! » » sundry items such as scotch tape, sewing thread and a sewing machine; one cup measure; measuring tape; scissors; funnel. Skills: Beginner’s sewing project. Ability to trace, measure, cut, and sew with quarter inch seams. 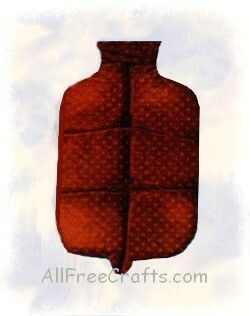 Print the top half and the bottom half of the hot water bottle template. Join the two halves with scotch tape. Alternatively, trace around a hot water bottle, and add 1/4 inch seam allowance all around to make your own template. Fold fabric, right sides together, and pin the template along the fold line where indicated. Cut out two pattern pieces like this. Pin the two fabric pieces, right sides together. Starting at one side of the neck, sew all round to the other side of the neck, using 1/4″ seams. Leave the top open. Turn right side out. Top stitch a straight line down the center of the pattern, from the nub on the bottom to the base of the neck. Use the funnel to put approximately 1/3 – 1/2 cups of rice in each side of the line just sewn. Now top stitch in a straight line across the pattern, trapping the rice in two segments, approximately 1/3 of the way from the bottom of the pattern. Repeat this step two more times, ending with a short sewing line across the neck of the fabric bottle pattern. See photo for details. Now turn in a quarter inch hem on the neck, and sew close to the edge to close.